One of the issues that usually arise when installing a Smoke Evacuation system (Constructive solutions) is when and how they should be opened in case of fire. In this post our intention is to clarify this point, as it is not too clear in the standard or even outdated in the case of the fast response of sprinklers or ESFR. 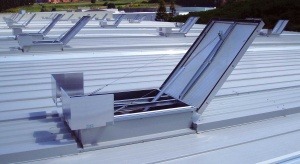 – A general one where the opening and closing of ventilation systems can be commanded automatically (connected to the detection system) or manual, by the extinguishing services. – Another one installed in the own ventilation system that works in a individual way usually activated by a thermal fuse and a bottle of CO2. (This system is bound by the CE marking thereof). The standard UNE 23.585 tells us about several functions that a smoke evacuation system can perform, such as protection of escape routes and protection of properties. Here we are going to focus on the case of the protection of escape routes since we understand that it should be mandatory to accomplish the target of saving lives. a) There is automatic sprinkler detection: Here the standard tells us in the point 7.1.2 that if the room has a Medium Risk, the smoke evacuation system must be activated automatically by smoke detection. In contrast, if the premises is High Risk, it must be manually operated by the fire extinguishing services at its discretion. b) There are no sprinklers, just detection: At this point, as the priority is leaving the escape routes free, it acts in the same way as above. c) No Sprinklers or Detection: There is no other remedy than allowing the system to be operated manually by the extinguishing service. d) There are a quick response by the sprinklers type ESFR and detection: in this case the current regulation does not contemplate them and it depends on the insurer and the autonomous community how to act. It is true that these kind of fast discharge systems are becoming more common in logistics and installed under American standards NFPA or FM in which it is determined that when there is a fire, the ventilation systems should not intervene. So if they are ventilating by means of the aerators, these must close automatically commanded by the detection. The opening will then be done manually by means of the extinction or automatic equipment after 15-20 minutes which is what the American standards calculate that such an installation needs to put out a fire or give the premises for lost, then the ventilation systems come into operation to evacuate the entire amount of smoke released. Do not forget also the thermal fuse of emergency installed in each apparatus, which can allow the opening of a discharge before time, creating an air current that affects the temperature of the smoke layer and prevent the proper operation of the sprayer. In installations with conventional sprinklers, fuses will be used in the temperature extinguishers at least 10º C above the sprinkler and in installations with ESFR type sprinklers, Factory Mutual recommends taring the fuses of the exutorios at 182º C.
A revision of UNE EN 12.845 has recently come into effect including ESFR and CHSArapid response sprinklers. It specifies that they can coexist with a Smoke Evacuation System provided when its activation is manual and done by the fire extinguishing services. But do not forget that these installations are most often used to ventilate especially when its hot or when the factory emits hot particles in suspension. Then ,it is obligatory to connect it to the detection system so that it closes in case of fire and does not interfere with the sprinklers.